You are here: Home / Ask A Photographer / What Photo Equipment Do I Need For Event Photography? 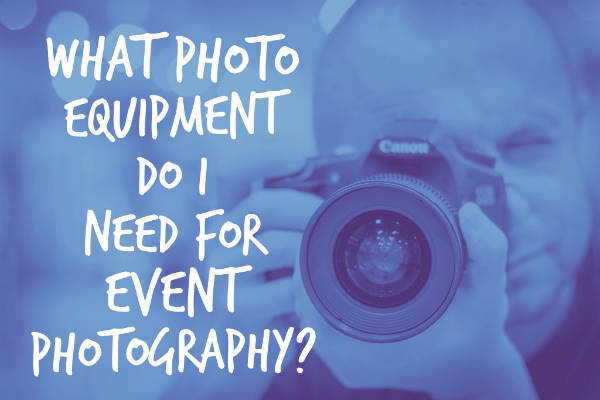 Question: What Photo Equipment Do I Need For Event Photography? I prefer not to specialize and want to exposed myself to lots of different types of photography. Such as corporate events, christenings, bar mitzvahs, weddings and sports. What type of cameras, lenses and other equipment do I need to be a successful event photographer? With a basic kit you want at least two camera bodies, two lenses and one flash. That will get you through 99% of what you want as a event photographer. Having a short lens and a long lens will cover the focal range. Having two camera bodies will help you have a bit of a back up as well, if one fails, double duty there. And having a flash will help you when it comes to low light situations, which a lot of the events that you listed here are mostly indoors as well, so that will help you not only to illuminate your subjects but also using the onboard IR which is the little red thing in front of your off camera flash, so on your speed light, is helps to focus and you can actually set that as a without to fire the flash but using the IR to focus which does help and it’s a pretty cool trick too, so I believe if you just read your manual, you’ll be able to work that out. In regards to lens choice. A lot of the events that you’ve listed here are indoors and having a F 2.8 lens as a minimum is definitely ideal. I know it costs more, they’re probably a little bit heavier, but it’s one of those things that if you’re serious about it and you want to get into it, it will help you. Of course you can get faster lenses the 1.2’s, 1.4’s that could be down the track when you want to spend a little bit more money and want to go down the path of using prime lenses. Your event is gonna dictate your lens choice and doing a lot of these events you’re gonna be doing wide group shots or you’re gonna be photographing from a distance, because you don’t want to get in people’s way, so then something like a 24 – 70mm and a 70 – 200mm as a good starting point will get you going. You did mention sports. Sports is a little bit different. If you’re doing team photos and 24/70 can help you there. If you’re doing head shots 70 – 200mm. If you’re doing on field action, then 200 mils is a minimum. So definitely 200, 300 or even 400 and 600 is definitely gonna help you there. But if you’re not doing that on a regular basis, then just getting a 24 -70mm and a 70 – 200mm as a bare minimum. F2.8 lenses would get you going there. Lighting equipment, having a speed light that touches to the top of your flash is definitely a good starting point. Having a second one just in case, could be just a lower end model is good to have as a back up. The idea of these flashes is of course to help us with illuminating objects in dark halls and that type of thing, they work really well, but what I’ve noticed is that if you’re using full power they do take a little time to cycle. And that’s when using battery packs, which you can buy externally and they plug into the side of the actual flashes help you big time so I believe my Canon flash takes four to six seconds to recycle on full power. By putting an external battery pack, which has eight AAs, including the four that are already inside the flash, it cycles withing two seconds. That helps if I’m taking group photos and I usually take one or two photos and just go bang bang and that can stop people blinking and just get two quick photos and you’re done and you move on to the next set of people and that works extremely well for me and they’re relatively inexpensive. You can get after market or you can get the original branded ones, just be weary with the aftermarket ones they could catch fire, I’ve been told but I do currently use an after market one that I got off Ebay and has worked quite well. The build quality is not the best, it is a bit flimsy and probably after I think five or six years I’ve had it now, probably due for an upgrade to something else. Just keep that in mind. Other lighting equipment could also be, well it’s actually the receiver to your off camera flash. You can of course have a light stand with an umbrella and this is if say if you’re doing family portraits in a very, very dark hall and you cannot bounce the light off the roof. Because it’s high and it’s dark like the roof is like say black and it’s not gonna do anything for you then having one light stand that you can put the flash on and use the remote receiver, the remote trigger that goes unto the top of the camera to fire the flash and having an umbrella which will spread the light and illuminate your subjects that way. You can do that. I’ve probably used that like one or twice in the five years that I’ve been photographing weddings, so I don’t know if … That’s why these things is nice to have and if you do have it you’ll never use it. With the lighting equipment you can get away with just having the external flash. Onboard flash is I think if you’re taken seriously, just like back up equipment, if you’re gonna be charging people, you just do it properly and get an external flash, preferably from the actual manufacturers themselves. What I did not mention was the brand of cameras or equipment. That really doesn’t matter. If you’re already invested in a brand just stick with that. One thing you may want to think about is full frame or crop frame. Full frame is gonna give you more coverage and when it’s in tight spots like if you’re doing I don’t know weddings and people are getting ready and it’s in a small room, yeah then you know having a wide angle lens with a full frame will get more in the picture. If you’re doing sports like on field action, having the crop frame camera can help you. I mean you can still use a full frame if you want but crop sensor camera will give you a little bit more distance, which could help you. Just picking a brand that you’re comfortable with or even a friend has so you can borrow lenses is one way to start and pick a camera brand but I won’t say any particular one is better because they’re all very good these days. And just to touch on batteries. They’re cheap, you should just buy stack of them and the Eneloop brand is really good, they’re made by Sanyo. When you do a fully charge and you leave them in storage they don’t lose all their charge like some other batteries, they only lose like 20,30% , which is excellent, especially if you forget to charge your batteries. Camera straps is one of the things that a lot of people don’t think about, but event photography you’re working for long hours on your feet and having good camera straps helps. There’s camera harnesses, I use the Holdfast money maker harness, it’s made out of leather and you can put two cameras on that and they basically have those links that you put to the bottom of the camera or to if you got a 70 – 200mm on the collar mount. You’re not gonna have the best posture, especially towards the end of the night, but I have noticed that if I don’t use my harness and when I don’t use my back the next day, next two three days in fact, I feel like an old man. That’s just something to take into account Nicole, having a good, especially if you’ve got two cameras working at the same time, one of each shoulder, having a harness is good. I think there’s several other brands, there’s the R strap I’ve used, I didn’t really like, it was just a thing across the chest, yeah just didn’t work for me. There’s several other, there’s holsters where you can have that links at the bottom of your cameras and they just holster on to you … There’s a base and they holster on to that. I think it’s called the spider holster I think.You just gotta try these things and see what works for you. To finish off with camera bags, you gotta carry all your stuff and I find having a little wheelie bag, if you got a bit of equipment, especially if you’ve got say two cameras and then you got a third one in your bag if it’s a back up or if you’ve got several other lenses or maybe you know a few flashes and batteries, that type of thing. Having a wheelie bag saves your back. If you’ve only got a little bit of equipment, a back pack is fine and then obviously you’ll take it off and store it somewhere, the same applies with wheelie bag. I use the Think tank bags. Obviously you can use Lowepro as well, but with the Thinktank bags I like how the bag has a little wire, which has a lock, now I can just fix it to a table or something, no one’s gonna steal it and the bag itself has a lock itself so yeah, doesn’t stop people from using bolt cutters but if you make it harder for them it’s better for you. Also I do use a lens bag as well, so if I’ve just got one camera and I’ve either got the second body in the bag or I’ve got say one camera and a flash and one other lens in this little lens bag, that’s also made by Thinktank and that works quite well. If you load up too much and you’re on you’re feet for a long time it can hurt your shoulders but having proper camera straps and using a camera harness will help you with that.